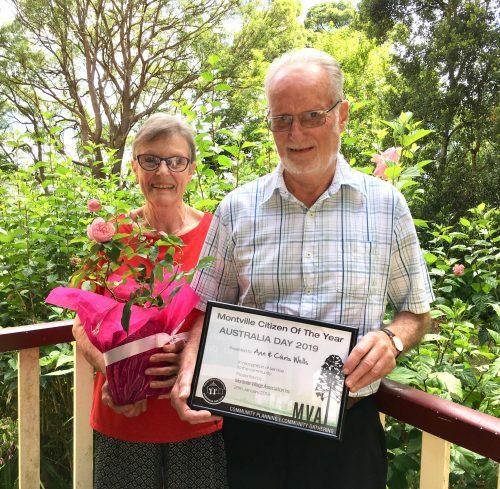 At Montville’s Australia Day Breakfast this year, Ann and Chris Wells were presented with the Montville Citizens of the Year Award. They were nominated by several people in the community and although I had already decided that this month’s Happenings would hold an article about them, because I wanted to know more about this couple, the award made this an even more timely moment to do so. So, who are Ann and Chris Wells? They are the lovely couple who run the IGA Express in the Main Street, behind the square. Most people know Ann and Chris, if only because they make purchases at the shop. But how well do we know the people who live and work in our community? When we rush in to buy our milk or bread or eggs that we had forgotten to buy for the cake we are making for afternoon tea, we perhaps aren’t thinking about the people behind the counter. But there is always a little story to everyone’s life and this is Ann and Chris’s. Ann was born in Kent, UK, in a village called Charing at the foot of the North Downs. Her parents separated after the war and Ann’s mother eventually went to work as lived in help in Surrey. The woman she worked for became her friend and this friend was Chris’s mother. So Ann and Chris knew each other from quite a young age and they went on to marry in 1962 and then emigrated to Australia in 1963. They arrived in Adelaide and here they stayed for many years. They intended to run a hotel as Chris, a few years older than his child bride, had trained in hotels in the UK but in Australia at that time, Ann was under age for a licenced business (she was only 18) and they bought a corner shop instead. Ann had been a legal secretary in London so this was quite a change – from typewriter to cash register. Ann and Chris ran the corner store for six years then moved on to another food outlet. Over the years they ran over 20 businesses in Adelaide alone, including a Toy World and a newsagent so their combined retail experience is vast. Their two children were born in Adelaide and for a long time they lived in the Adelaide Hills where they farmed cattle and sheep and they also continued to run their retail business in the city, an hour away. Their son, Mark became a great horseman, competing for South Australia in Eventing. Eventually, Ann and Chris felt it was time for an adventure so they decided to travel around Australia. They pulled up in Mapleton to visit family and went no further. They thought that retiring might be a nice thing to do, so they sold their caravan and settled down. But the Wells’ did not really like retirement and their next retail adventure saw them take the cosmopolitan ideas of Adelaide into an old Nambour bakery which they transformed into a café. Their daughter, Sara, worked in the café with them until, after some time, they sold up, thinking they would try retirement again. Then disaster struck! In late 2013, the Montville Post Office closed. This was a huge blow to the community – not just for the residents but for the businesses as well. People were so concerned that an MP took up the baton on their behalf and a community meeting was held with the Australia Post state manager. At the time Ann and Chris were in France on a walking holiday and had ended up on a cruise there. Ann fell into a loch and broke her leg and their holiday was cut short. This turned out to be fortuitous for Montville! On arrival back home, they attended the community meeting and before it was over, the Wells’ had put their hand up, said they’d take the Post Office on, had put in an offer, and there and then, the deal was struck. The landlord of the IGA bought the strata title on the little shop next door to the IGA (which is where the Post Office now is), knocked the two shops together, redecorated and voila! the Post Office re-opened in March 2014 and as well as Ann at the helm, there is Post Mistress Kay and between they can solve all your postage problems and headaches. And as of 3 March 2019, the Post Office celebrated 5 years at its current site. There is a bit of a uniqueness about the Montville IGA. Here you will find a selection of Ann-baked cakes and biscuits and Ann-Made items which add a little something extra to the every day. Ann started baking when she and Chris had their café in Nambour. They employed a chef but she wanted to add some baked goods so she made carrot cake, brownies and caramel slices and other delights and she continued to make these when she and Chris took on the IGA. Her chutneys started from a supply of over-ripe tomatoes which she didn’t want to see go to waste and she soon added marmalades to her home-made produce. Ann and Chris employ a manager, two part-timers, two cooks as well as work in the business themselves. This makes the IGA one of the biggest employers in Montville. But Chris and Ann don’t just run a business – they help raise funds for many things in the community and further afield. They donate to the Animal Welfare League and to a quilting group that supports domestic violence victims. Currently they are helping to raise money for the new Village Hall deck through their $2 books (novels and non fiction) and donations in a tin that sits on their counter. They raise money for the Montville State School and for the Rural Fire Brigade and recently they raised funds for the ongoing Queensland drought. For a bit of downtime, Ann and Chris garden, and Ann sews bags to be sold in the shop. 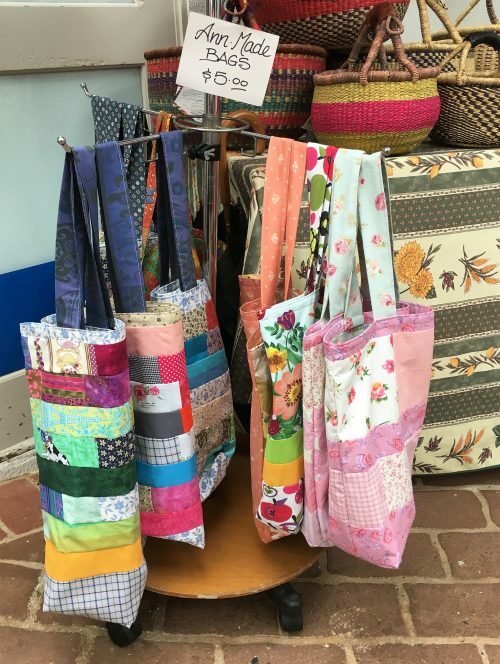 Ann and one of her part-timers, Lorraine, use their sewing skills to make patchwork shopping bags which they sell for $5. Ann said they love making the bags and have great fun creating and crafting. They started doing this when plastic bags were being banned. Material comes from anywhere and everywhere and Ann and Lorraine whip it into shape. If you would like to know more about the history of the Montville Post Office, there is an interesting article on the Montville History Group’s website: https://montvillehistory.org.au/projects/montville-post-office/ which provides all the history from its inception as a Receiving Office in 1897.